If you’re a regular listener you’ll know that alongside hosting this podcast I’ve been writing my OWN business book, which was published in March 2018. 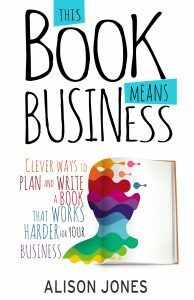 This Book Means Business: Clever ways to plan and write a book that works harder for your business brings together everything I’ve learned from the successful authors and publishers who’ve shared their secrets in the Extraordinary Business Book Club. It’s the essential handbook for anyone thinking about writing a book to build their business, with a mind-stretching selection of proven tips and techniques to help plan, write, publish and promote a book that’s integrated with your platform and works to build your reputation, network and credibility from day one.